Are You a Candidate for NUCCA Care? Your first visit at Stork Spinal Care is an education process. We learn about you and your health concerns, and determine if we are the right place for your care. You learn about our office and decide if we fit your needs. During your 60 minute appointment with the doctor you will review your health history, what has worked and what hasn’t worked. The doctor will perform a series of tests to determine if we can accept you as a patient and help you the way you want to be helped. 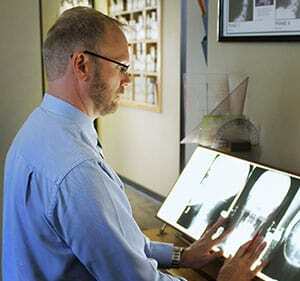 If we determine you are a candidate for care, we will perform three x-rays to measure your unique adjustment vector. On your second visit, you will sit down and meet with the doctor to review your examination findings. The doctor will discuss with you program options to obtain the results you are looking for. Your program is individual to you and based on several different factors from your examination. Bring your questions; they will be answered before you receive your first adjustment. The adjustment itself will only take a couple of minutes to perform. You will barely feel the doctor touching your neck during the adjustment and there are no twists, pops or forceful movements. After the adjustment, one or two post xrays will be taken and you will rest for 20 minutes in the relaxation room. Please allow 60 minutes for the entire visit. During a regular office visit, the doctor will determine how your body is doing with the adjust from the previous visit. We will perform a series of pre and post measurements which will tell us how your body is progressing. This visit will last about 10 minutes. After, you will rest in the relaxation room for 10 minutes. We believe that our bodies have been designed with and given an innate wisdom, or intelligence. The conductor of this wisdom is the nervous system – your brain and spinal cord. The delicate connection of that system is at the top of your spine, protected by your skull and the tiny, number one bone in your neck, called the atlas. We gently adjust this area of your body because it is a control center, having its “hands” in virtually all other functions of your body – including the other muscles, bones and nerves in and along your spine. Our goal is to correct this misalignment as quickly as possible so your body may stabilize and heal in a balanced position, allowing 100% flow of the electricity from your brain to reach your body, and equally, flow from your body back to your brain. This is connection. This is body balance.